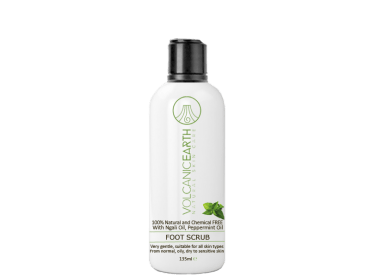 Volcanic Earth Foot Scrub helps to slough away rough patches of hardened skin, to leave feet soft, smooth. Helps to relieve skin irritation, itchiness, tired feet. and increase circulation. Gives the skin a subtle scent of Peppermint. Medicinal uses of peppermint extract are well documented (see main peppermint article). For example, Peppermint extract is commonly used to soothe symptoms of the common cold and the flu. It is also a digestive aid which may relieve bloating and flatulence. Moreover, it may be used to aid in the relief of pain from menstrual cramps and tension headaches, and because of its cooling properties, it may relieve itching when applied topically. Additionally, peppermint oil has been shown to be an effective remedy for Irritable Bowel Syndrome (IBS) with constipation. Additionally, peppermint extract is believed to have antiviral and medicinal properties which may help in the treatment of herpes and the disintegration of gallstones. 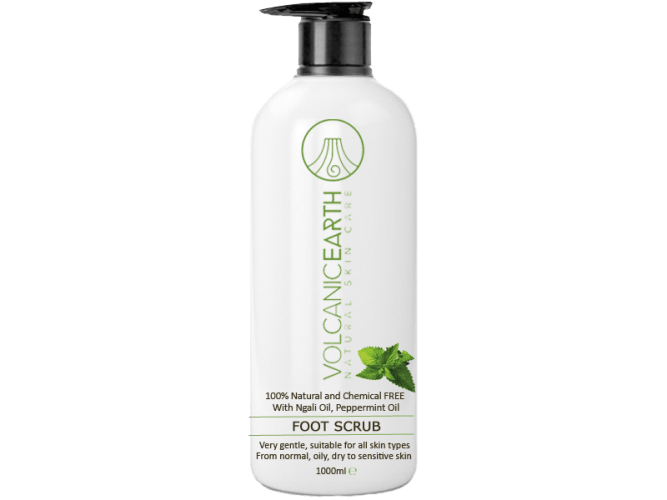 Volcanic Earth Ash has is one of the other special activities in Volcanic Earth Scrubs. Not only the face (eczema, psoriasis, acne) but also the entire body has advantages of volcanic ash. Volcanic ash is mainly used for general health or beauty effect in Spa & Wellness. One can think of restorative effect on skin problems, rheumatism, muscle pain and osteoarthritis. Because of the heat it is also relaxing, stress-reducing, good for circulation. The sweat reaction effluent will be discharged through the skin. Specially team collected the ashes in large quantities. Not everyone can and may collect this type of ashes on the island because of land rights. Volcanic Earth ™ volcanic ash comes straight from the mouth of the most active volcano worldwide. Our peppermint oil comes not only from mother nature, islands of Oceania. Peppermint oil is extracted from the upper parts of peppermint. Unfortunately, not much peppermint oil comes from the plant, making the real authentic oil expensive. Peppermint oil is mainly applied externally for tension headaches. That's why it's nice to know when the feet are treated with peppermint, the smell has a positive effect on your memory and attention as well.